Maps are a fascinating resource, capturing a location in time and space. They have a place in the visualisation of research and used as the basis for analysis. This guide aims to introduce you to maps and mapping data, print and digital, available through the University of Southampton and to sources of open geospatial data. Printed maps and charts are held in Hartley Library and the National Oceanographic Library. The Geography and Environment Map Collection can be found in the Hartley Library on Level 1 at the south end. It is a historic collection, reflecting the interests of the research and teaching of Geography within the University. The collection contains maps from the UK and from a range of countries worldwide. 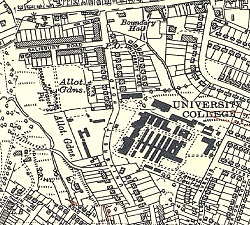 The UK map collection holds maps in a variety of scales from 1:2,500 to 1:625,000. The largest collection is of maps produced by Ordnance Survey beginning with the 1st 1:63.360 series, and then moving on to 1st, 2nd and Landranger 1:50,000 series. There are also collections of administrative area maps from Great Britain in the 20th century, Bartholomew's Postcode maps, County series maps and land use maps as well as other specialist interest maps. For further detail see the UK maps. As well as maps from the UK, the collection includes a range of maps from throughout the world, covering all continents. This includes a large collection of maps of France, held in a variety of scales - see Europe maps. There is also a wide coverage of African countries - see Africa maps - in the collection that reflects the historical British interests in that continent. For other continents choose the appropriate tab above. As is the case for the UK maps this world collection is historic in nature. As well as maps, the Hartley Library also holds a number of historic cartographic atlases. A collection of these has been brought together on level 1 near the map collection. Work is in progress to catalogue these as a single collection. They are currently housed on shelving near the map chest sequence. While this is the main collection there are also atlases on specialist topics held on level 5 in the folio and double folio collection.